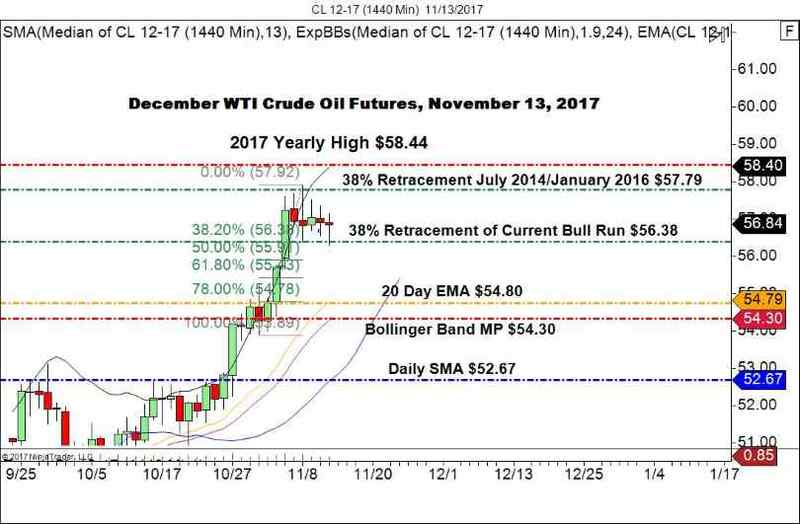 November has been a good month for WTI crude oil, with price moving directionally towards 2017’s high. However, the past four sessions have become increasingly condensed. There are several reasons for this, but the market technicals have been the primary factor prompting bulls to take a moment and re-evaluate the long-term strength of oil. Currently, December WTI crude futures are threatening a key support area. If it is taken out, we may be in a position to realize a correction going into this week’s inventory cycle. It has been a theme across the markets today, but rotation continues to the rule. Thus far December WTI crude oil futures have traded to the bear under increasingly diluted volumes. Volume is almost 3:1 in favor of December over January, but this will continue to decrease as we move forward. Sideways trading between macro support and resistance levels has defined the last week of trading but is likely to break due to upcoming rollover from December to the January contract. Overview: For the moment, WTI crude is trading horizontally between the two 38% Fibonacci retracements. This is a key area for long-term pricing, as a failure to establish trade above the macro 38% level at $57.79 will lend credence to the devaluation that began in July of 2014. I will not be looking to take a position in this market until today’s range is final. Going into the Tuesday/Wednesday inventory cycle, we may have the opportunity to short the macro 38% Fibonacci retracement at $57.79. Check back during the overnight and early U.S. session tomorrow for an update or trade recommendation.